After Hop on Pop, the next most important book ever in my life was also by Dr. Seuss. 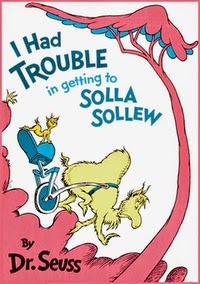 I had Trouble in Getting to Solla Sollew is the perfect story. There’s a brilliant beginning, a middle fraught with rising conflict, and a bittersweet, empowering life lesson and personal growth at the end. Perfect. In the beginning: “I was real happy and carefree and young and I lived in a place called the Valley of Vung, where nothing, not anything ever went wrong. Until….” In a mere twenty-seven words, we have a vividly drawn protagonist, a setting, and a situation on the brink of change. In the middle, the poor protagonist suffers a stubbed toe. First solution? Watch where you are going. Then he’s bitten from behind. Second solution? Aim eyeballs in different directions. Vowing vigilance ahead and behind, he is attacked from above and below. Now he’s in a real quandary because he only has two eyes. What’s a lad to do? He sets off on a journey to find a new and safer place he’s heard of—“the City of Solla Sollew on the Banks of the beautiful River Wah-Hoo, where they never have troubles! At least, very few.” This classical hero’s quest takes him through terrible trials in which, just as hope is in sight, something else goes horribly wrong repeatedly. The final insult, the ultimate crisis, is the single trouble with Solla Sollew: the door to almost-paradise is locked, barred by a key-slapping slippard. At the end, the moment of truth, the hero learns of a more distant Utopia, “the city of Boola Boo Ball on the banks of the beautiful River Woo-Wall, where they never have troubles! No troubles at all!” He’s wary; he’s been let down by so many promises along the way. Can he flee trouble one more time, just a little farther, for a promise? No, he decides. Something in him has changed. After facing Poozers and billions of birds and a flubulous flood and a camel with gleeks, he has outgrown his innocence. He wasn’t passive to begin with, but now he’s stronger and wiser, and he picks up a weapon and heads home. I can’t even convey how much I loved this story, how many times I read it until it was memorized, and how much I still love it today. I think it is Seuss’s crowning glory.